Does your heart melt whenever you look into the soft, imploring eyes of the one you love? Is your sweetheart waiting for you happily at the end of your long day? Do you look forward to your honey's warm, wet nose, and furry ears? We know -- dogs and cats make the best Valentine's ever. There's no need to get them chocolates, and they have no use for flowers. In fact, these gifts are actually dangerous for them. But do you know why? Here are some great tips that will help keep your pets safe this Valentine's Day. 1. Never give your pet chocolate! Even small amounts of chocolate can cause vomiting and diarrhea in dogs. Truly toxic amounts can induce hyperactivity, tremors, high blood pressure, a rapid heart rate, seizures, respiratory failure, and cardiac arrest. 2. Sugar-free candies and gums often contain large amounts of Xylitol, a sweetener that is toxic to pets, especially dogs. If ingested, it may cause vomiting, loss of coordination, seizures, and in severe cases, liver failure. If your dog or cat should ingest chocolate, gum, or candy, this is an emergency and you must call us immediately. 3. 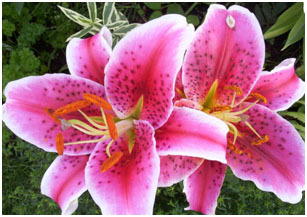 Lilies are extremely toxic to cats and cause acute kidney failure within a day or two of exposure. If untreated, the exposure will likely result in death. The ingestion of just one or two leaves or petals can cause sudden kidney failure. Even ingesting small amounts of pollen from a cat’s fur is considered poisonous. Thankfully, these plants don’t cause serious harm in dogs – only in cats. When ingested by dogs, they will result only in mild gastrointestinal upset. Within a few hours of exposure cats may develop drooling, not want to eat, and lethargy. These signs progress to increased thirst and urination and severe kidney failure. Without treatment, lily poisoning is fatal in cats. If you suspect your pet had had any contact with a lily contact us immediately. This can be a life and death emergency. 4. 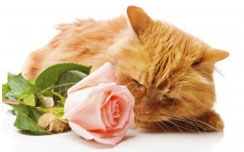 Although roses do not often cause serious poisoning beyond gastrointestinal upset, there is risk of trauma to the mouth and paws from the thorns. If a large amount is ingested, a bowel obstruction may result. Drooling, pawing at the mouth, not eating, vomiting, diarrhea, lethargy, and abdominal pain or discomfort may be signs of ingestion. Check the mouth and paws for signs of trauma from thorns. Treatment by us may be necessary, including a thorough oral exam under sedation, pain medication, antibiotics, or even anti-vomiting medication.